Photograph courtesy Danny Preston, collection of Neil Johnson. 24079 & 24133 work April 3rd 1976's Shrewsbury - Red Bank parcels train, seen somewhere near Shrewsbury. The sixteen year two month career of D5079/24079 was spent entirely on the London Midland Region apart from its very brief (paper only?) allocation to the Eastern Region. March 1960 to Willesden (1A), on loan. August 1960 to Rugby (2A) on loan. September 1960 to Willesden (1A). October 1960 to Longsight (9A). October 1960 to Carlisle Upperby (12B) on loan. May 1961 to Willesden (1A) . December 1966 to Stoke Division (D05). May 2nd 1976 to serviceable store. After withdrawal 24079 was stored at Crewe until May 31st 1977 when it was moved to Swindon Works, and scrapped there during the last week of September 1978. Movement: 24079/85, 24134/41 as the Crewe - Swindon on May 31st 1977. Noted Derby Works September & October 1962. Noted Derby Works January, February & May 1964. Noted Derby Works March & October 1972. Noted Derby Works May 1974 (Classified). 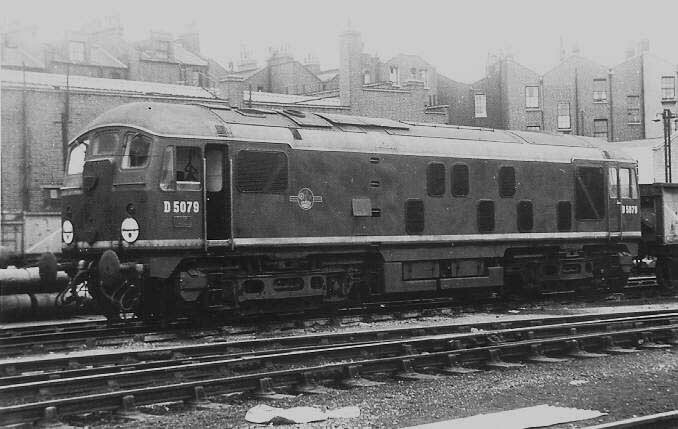 D5079 was from a batch of eighteen machines (D5076 - D5093) built at Crewe, with delivery at least on paper to March (31B), if it actually reached there in February, its stay was brief being quickly transferred to Willesden (1A) during March. D5079 moved to Rugby (2A) in September. With the end of the summer season the Rugby - Norwich working reverted to a Type 2, usually D5079, during the summer this was a Rugby Stanier Class 5 duty, required for the 10-12 bogies, the winter service only carried five. A further move north for D5079 was to Longsight (9A) in October, and then onto Carlisle Upperby (12B) in November. This is believed to be the first BR/Sulzer Type 2 allocated here. Whilst at Carlisle it became a regular performer from October 19th on the 8.05am to Hellifield and its 11.17am return, a duty it performed to the end of the year with few absences. The down working also involved the collection of loaded milk tankers from various locations, adding considerably to the weight of this working. During January D5079 was also noted on trips to Carstairs, on the Carlisle - Carstairs leg of the 1.05pm Euston - Perth. By the end of March it had been replaced on the Hellifield run by Class 5s, Clans or Jubilees. During June D5079 headed south, its home for the next five years became Willesden (1A). Photographer not known at this time. The view here of D5079, believed to be Camden, shows the locomotive in pretty much the condition it was delivered in, though somewhat grimier. Clearly visible is the original location of the exhaust port, very close to the boiler exhaust. The roof mounted water filler cover is still in place and the locomotive carries the smaller capacity fuel tank. Condition no month: green livery with small yellow warning panels, rounded upper corners, warning panel partially covers frame level stripe; gangway doors present, full size water tank, shortened fuel tank, blanking plates fitted, hand/footholds present, ridge sided sandboxes, three rung bogie mounted footsteps, valencing present. With electrification virtually complete at the London end of the WCML and Willesden receiving the latest Class 25s from Derby Works the mass exodus began to the Stoke Division (D05), with D5079 heading north in December, as part of the first batch (D5073 - D5081) to reach here. 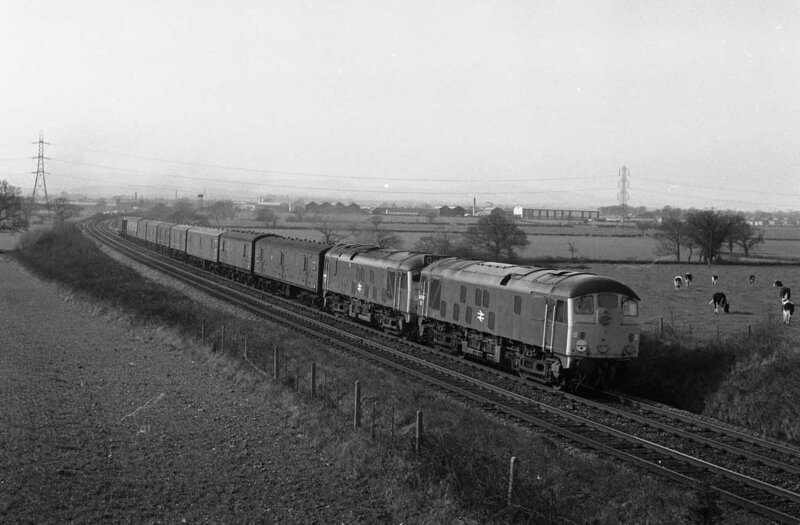 As the New Year opened Shrewsbury commenced diagramming Class 24s for the Cambrian freight working, which would have included the three featured locomotives, they would work these services for the next seven years. Condition July: small yellow ends with curved upper corners, blanking plates in place, hand/footholds still present. 5079 was under repair at Derby Works during January. Condition August: Green with full yellow ends, gangway doors in place, shortened fuel & water tanks, blanking plates in place, hand/footholds plated over, valencing removed, no visible totem/emblem on non-BIS side. 5079 visited Derby Works at least twice, in March and October. 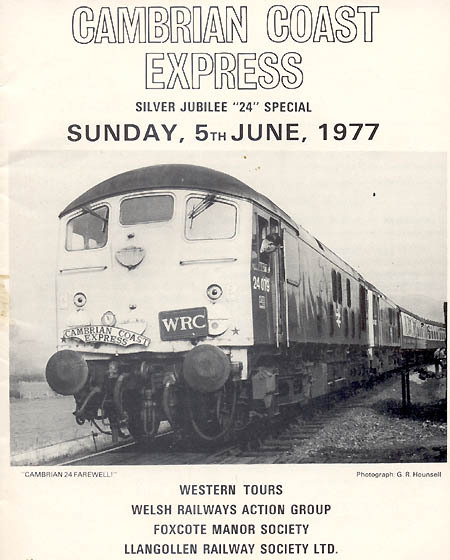 On June 10th the first F&W railtour took passengers from Gloucester to Pwllheli on 'The Snowdonian' with 5079 & 5087 in use west of Birmingham New Street. With the discontinuance of the LMR Divisional allocations, 5079 was now allocated to Crewe. 5079 was at Derby Works during May. Condition summer: Blue/yellow livery, gangway doors sheeted over, shortened fuel & water tanks, blanking plates in place, hand/footholds plate over. 24079 worked the Aberystwyth - York postal to? on June 27th. 24079 missed the massive withdrawals of the LMR Class 24s during the summer of 1975, seeing service into early 1976. On April 3rd 1976 24133 & 24079 arrived at Shrewsbury with a mystery excursion from Manchester to Swansea the Class 24s were replaced by headlight equipped 37181, the excursion was therefore most likely destined for the Central Wales route to South Wales. A pair of Class 24s led by 24079 feature on a programme for a Class 24 railtour run by the Wirral Railway Circle. The tour on June 5th 1977 ran from Crewe to Barmouth and the locomotives used on this day featured 24082 & 24133. 24079 was withdrawn on July 17th 1976. Page added March 5th 2004. Last updated November 22nd 2017.